Need to find a pet friendly hotel in Pass Christian MS? Click the Pet Friendly Accommodations Button below! 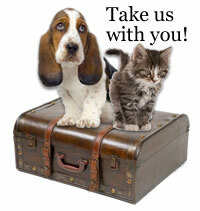 Finding pet friendly hotels in Pass Christian is easy with PetTravel.com. Click the SEARCH PET FRIENDLY ACCOMMODATIONS button above for a list of pet friendly hotels, motels, bed and breakfasts, small inns, and vacation rentals in Pass Christian. You can even book your reservations on the same page! We have over 26,000 pet friendly hotels and accommodations in 5,000 cities around the world where you can take your dog or cat. Just fill in the box to the left and search our database. Watch for the Search Other Pet Friendly Services button above for pet friendly beaches, parks, and other pet friendly services. Come back and visit often as we are always adding new and exciting places for you to visit with your pet.